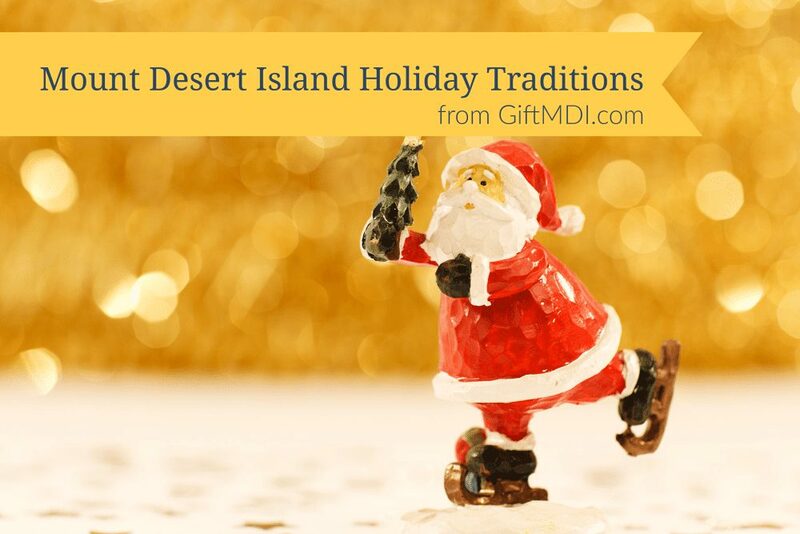 Santa is coming–and so are the accompanying local Christmas traditions! Some say MDI can be dreary this time of year but not if you are out enjoying these fun holiday celebrations! Every year in early December Witham Hotels holds a fundraiser for the Witham Family Hotels Charitable Fund. It is right here in Bar Harbor at the Atlantic Oceanside Hotel. It is a lovely Christmas celebration fit for the whole family. There are craft tables, a photo booth, holiday games, holiday movies, cookie decorating, and (of course) hot chocolate! There is a raffle where you can win cool prizes. Kids can write a letter to Santa, and they will receive a reply before Christmas. Not only do you get to run into some of the locals you may have not seen since the summer season, but you will also get to meet Santa and Mrs. Claus! This is an all-day event in early December put on by the Mount Desert Chamber of Commerce. In the morning, there is a Kids Fun Run and a Frosty 5k for all ages. Make sure to arrive early enough to register! After there is card-making, wagon rides, horse & carriage rides, Santa’s workshop, and other fun activities. The stores in Northeast Harbor are also open for holiday shopping and deals. Our favorite moment of the festival, which brings out our inner child, is when Santa arrives via boat in the harbor! There is a bonfire and the event is capped off with a performance of The Nutcracker at The Harbor House. What is pleasant is choosing your most silly pajamas and getting your holiday shopping started early with local shops in downtown Bar Harbor? And who can overlook the greatest Bar Harbor sport: bed races? It is the time when the finest local athletes stretch out their hamstrings and flex their muscles in state-of-the-art bed engineering to race down Main Street for a cash prize. Set your alarm clock, but don’t get dressed (as long as you already have your pajamas on! ), and join in on the fun (usually in mid-November) put on by the Bar Harbor Area Chamber of Commerce. You don’t have to stay up to midnight to enjoy Midnight Madness in Bar Harbor. Another more friendly local alternative to the sheer madness of Black Friday, festivities start a bit earlier and end around midnight. You can start the holiday spirit off with Santa lighting the downtown Christmas tree and reading ‘Twas the Night Before Christmas. Then Santa and his followers head on over to the MDI YMCA to partake and craft tables and other holiday activities (with Santa listening to wishes and offering photo opps). Then from 8:00pm until midnight local vendors will have great sales on merchandise–a prime time to get your Christmas shopping done. Don’t miss out on this great Bar Harbor tradition, which usually happens in early to mid December. For over a century, Maine Coast Seas Mission has been helping bring holiday cheer to all. Through their Christmas Program, Maine Coast Sea Mission distributes 10,000 gifts to children, families, nursing home residents, and prisoners in Washington and Hancock counties as well as the local islands. You can join in on the program and help everyone enjoy Christmas. The Bar Harbor Congregational Church gets in the Christmas spirit full throttle in early December every year with its annual Christmas Fair that includes a luncheon (featuring a variety of healthy and yummy food to meet diverse dietary needs) and a raffle that features gift certificates and goods from local businesses. This is a great event that takes place during the day. For Christmas Spirit offered during the night, they have a Living Nativity that features about 60 performers done usually over two nights (one of which typically coordinates with Midnight Madness). Day or night, don’t miss out on the fun! MDI locals will drive to the Trenton Bridge Lobster Pound to enjoy their annual Lobster Crate Christmas Tree, which is often set up right after Thanksgiving and lit at night through the holiday season. Check out the story WDEA did on it or the Trenton Bridge Lobster Pound Facebook page for the story behind the tree made of old lobster traps. Are there any traditions we’ve forgotten? Comment below and let us know!